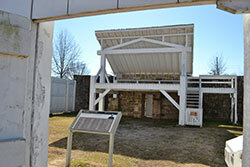 Fort Smith National Historic Site: There’s a reason why this is a National Park —many reasons, actually. Get up close to history dating from the Indian Wars and Westward Expansion, the Trail of Tears, the Civil War, Jim Crow era, and Isaac C. Parker’s famous federal court where more than 100 Deputy U.S. 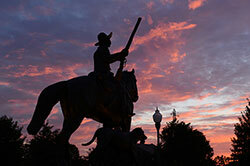 Marshals died in the line of duty capturing outlaws in Indian Territory. Visit the jail and gallows, walk along the river trail, and ask rangers about the best Fort Smith outlaw stories they know. The Park at West End: This gem of a park studs the west end of downtown Fort Smith with its vintage, working Ferris wheel and carousel, train car diner, and double-decker concession stand, and nearby splash park. Rides are operational April through October. 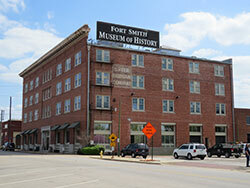 Fort Smith Museum of History: It’s three stories tall, about a thousand stories full, and full of ice cream and presents at the bottom. Stop by the Museum’s working soda fountain and the gift shop while you wander through exhibits of seriously interesting artifacts. The Clayton House: If you enjoy touring old, historic homes of days gone by, don’t miss Fort Smith’s most famous—- and most haunted — home. 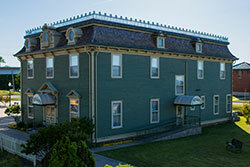 Fort Smith Regional Art Museum (RAM): The best art in the area, with traveling exhibits from all over the country. RAM’s home is in a renovated building that once one a modern architecture award. Chaffee Barbershop Museum & Historic District: There’s much to see and do at Chaffee Crossing Historic District, but it started with the Chaffee Barbershop Museum’s striking history of refugees, motion pictures, Army soldiers, and even Elvis Presley. Visit the Janet Huckabee Arkansas River Valley Nature Center while you’re there; it’s impressive. Read more about the “unexpected” art murals in Forth Smith, click here.